Primary menu supports up to 6 items (depending on their names) because of the width limitation. If more are added, the extra is not visible. 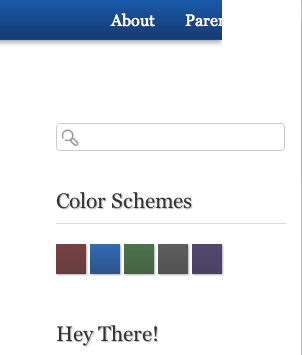 The Preview script and stylesheet are loaded if you haven’t placed any widgets on your sidebar, this results in a Color Schemes block in the sidebar. Drop at least one widget on to your sidebar to get rid of it. Available languages: Russian (ru_RU by Konstantin Kovshenin), Italian (it_IT by Gianni Diurno). Feel free to contribute! Take a look at the live demo or download for free at the WordPress Themes Directory (and don’t forget to give it a 5-star rating, thank you!). Any comments and suggestions are welcome and encouraged. Use the comments section below and don’t forget to share this! Sorry, was in a rush yesterday evening, fixed ;) Cheers! The theme is simple, clean and easily readable. Good work! Hi Igor, you can decrease the font size in style.css line 47 (version 1.2), the rest of the space is allocated to the navigation menu on the right, but if you're not using too many menu items you can go ahead and change grid_2 to grid_3 on line 49 in header.php and on line 52 change grid_5 to grid_4. Hope that works for you, cheers! One more thing, please. How can I remove the time and date from the posts near the Post title, and make the Blog title show in H1. You're welcome. Damn I must have missed that, you're right, go to single.php and page.php, find h2 and replace with h1, the style won't change. I must have copied them from the front page, where 10 h1 tags are inappropriate. I've already lined up this fix for 1.3, thanks so much for your feedback! Date is in single.php and page.php somewhere on line 18, but be careful with that, since it's also a permalink to the post which is necessary when a post does not have a title. Thanks, it worked but I had to change the H2 into H1 in index.php too. Thanks again. I would be nice if the th element has the color Scheme of the actual theme. Thank you Teylor, yeah I guess I missed that, but it's now in the roadmap for 1.4, thanks for the comment! Peter, thanks for your comments. The gray alignment issue appears when screen resolution is low, what size are you viewing? The current minimum is 1024 pixels wide with full-width browser. I'll be fixing that bug in 1.5 to target screen less in width. The menu cut is strange, I'll have to get myself a Mac to test things out :) Does it appear on Firefox too? Lovely theme! Any plans to incorporate thumbnail support? hey budyy thanks for the theme itis clean clear and georgia i couldn't have asked more thanks bro! Love this theme. However, I have some modifications I want to make but am having trouble with the child theme I created. (You can see my blog here: http://jassy.everysongends.com/) with the child theme activated. I forgot to import the 960.css theme. All fixed. Sorry to bother you!